The Master and Scientology: Just how much of Lancaster Dodd comes from L. Ron Hubbard? 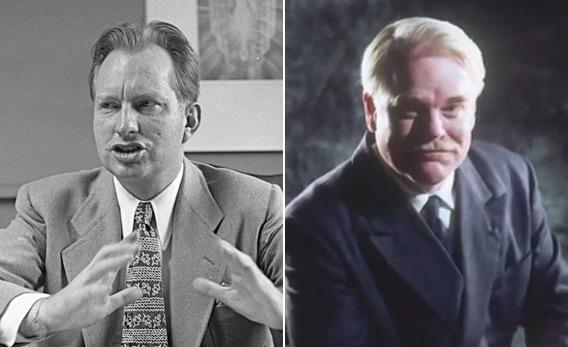 The Master’s Lancaster Dodd (played by Philip Seymour Hoffman, right) was inspired by L. Ron Hubbard. Photographs courtesy of the Los Angeles Daily News and The Weinstein Company. But the movie does draw extensively on Scientology and its past. Anderson finally admitted outright a couple weeks ago that he based the charismatic leader Lancaster Dodd (Philip Seymour Hoffman) on Hubbard, adding that much of the film “related to the early days of Dianetics.” What parts of the movie, exactly, are based on Hubbard and the secretive religion he founded? We’ve seen some of the similarities broken down as they existed in an early screenplay, but much of the film has changed since then, and many of those parallels did not make the final cut. So herewith, we’ve compared these two religions and their founders to delineate exactly where Scientology ends and The Master begins. Scientology centers around a procedure called “auditing,” which uses probing questions and other techniques to identify traumatic memories (called “engrams”), to drain them of their power. Dodd’s spiritual practice, called The Cause, employs similar techniques, prompting “guinea pig and protege” Freddie Quell (Joaquin Phoenix) to revisit painful experiences and others to go back before their birth and beyond. 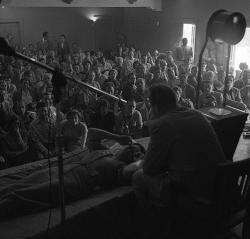 Both leaders’ techniques also seem to have their origins in hypnosis, another practice at which Hubbard had become very skilled, and in each case variations have included compelling people to stare at each other without looking away, or even having people take turns heckling each other. 100) Are you logical and scientific in your thinking? But why the odd name “The Split Saber”? Anderson may have been inspired by the grandiloquent title of Hubbard’s rumored early manuscript, Excalibur, which the Church of Scientology says that Hubbard wrote in 1938. Just like Lancaster Dodd, L. Ron Hubbard had multiple children with multiple wives, and many of his ex-wives went on to become his critics. (In The Master, Amy Adams’ Peggy Dodd says that Dodd’s ex-wives have become some of his most vocal opponents). In an earlier version of the script, Dodd, like Hubbard, was married to a woman named Mary Sue. However, in the finished film Dodd’s wife is named Peggy. Dodd never lays out his full theology in The Master, but we do get bits and pieces. The Cause, like Scientology, promotes the idea of reincarnation, believing that through “processing” people may recall past lives. In The Master, we last see Dodd sometime later in the 1950s, when he has relocated to Britain. (The timeline isn’t obvious.) There, he works in a mansion on a hill in the English countryside. Hubbard similarly moved to the English countryside, in 1959, where he set up shop in a Sussex mansion called Saint Hill Manor. Some of the similarities between Hubbard and Dodd are more incidental. For example, there’s a scene in The Master in which Dodd goes out to the desert to play a game of “Pick a Point.” The game involves choosing a point on the horizon and then racing there as fast as you can, even if that means riding a bit recklessly. The suspense of the scene echoes an incident in the life of L. Ron Hubbard, who crashed a motorcycle in southern Spain in 1974, suffering a broken arm and several broken ribs. Both men love boats, too. Dodd, like Hubbard, is fond of doing his thinking while on the sea. When Quell first meets Peggy Dodd, she tells him that working on the water helps Dodd escape the distractions of naysayers and critics. As The New Yorker reported in its article on Paul Haggis, the sea “provided a ‘distraction-free environment,’ allowing Hubbard ‘to continue his research into the upper levels of spiritual awareness.’ ” Hubbard of course eventually established a whole fleet of boats, staffed with young volunteers, called the Sea Organization. Of course, as with the rest of the film, Anderson adds his own details and personal touches to complete the picture of the man he’s (mostly) invented. Did L. Ron Hubbard have an affinity for the song “Slow Boat to China,” as Dodd does? Who knows. But Anderson may have caught an interest in that song from someone else entirely: his former flame Fiona Apple.